Mobile and tablet slot games seem to be getting better and better by the week, but what use are state-of-the-art slots if you don't have the right device to play them on? 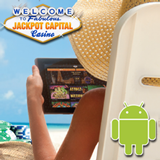 Luckily, Jackpot Capital Casino is seeing to that by giving away 20 Google Nexus Tablets, and all you need to do to give yourself a chance of winning one is deposit $50 or more with the innovative casino site. For each $50 deposited you will earn a ticket to a daily draw, which will award one tablet each day until August 15th. Jackpot Capital's mobile casino is specifically tailored to work on Android phones and tablets, with high quality games like Aladdin's Wishes and the brand new Triple Twister slot optimized for the smaller screen size. The mobile casino is perfect for the Google Nexus 7, a pocket-sized seven-inch tablet. The wide range of RTG slots look amazing on the top-of-the-range device, and 20 lucky players will have the chance to experience everything that the Nexus 7 and Jackpot Capital Mobile Casino have to offer. And remember, there's still time for players across the world to claim 20 free spins and a deposit bonus of up to $150, as part of the Triple Twister launch celebration.